This Japanese Pancake is so delicious and amazing. Once you taste it, you’ll find yourself lost inside its amazing taste and flavor. If ever know how to do it, don’t worry. Because, Today I’m going to show you, how to make this super fluffy airy Japanese pancakes, step by step in this post. 1- So, like most other pancakes, the Japanese pancake recipe starts with buttermilk and eggs yellow. 2- Add a little bit of lemon. It’s optional but highly recommend you to add it. Because it’ll give some extra flavor to your pancake. 3- And add some melted butter to give these wet ingredients a good mix. So, they’re combined. 4- And then add the dry ingredients mix, but do not over mix them. Otherwise, your pancake will be very tough. And obviously that’s not how you would like pancake to be. 5- Put the whole mixture aside. And take another bowl and add 3 large egg whites in, and add some lemon juice you can add some cream of tartar if you prefer as well. 6- Whip these up, and slowly keep incorporating the sugar. This is what will give your pancake that big rise, and make it really fluffy, and give it that classic jiggle you want. 7- Keep betting the egg’s white, until they reach stiff peaks. And then fold these into the pancake batter. 8- Mix about 2 to 3 tablespoons at first just to line the mixture, so it’ll be easier to fold in the rest of the egg whites. 9- Once you add the rest of the egg whites, gently fold them in, and be careful to not deflate them. 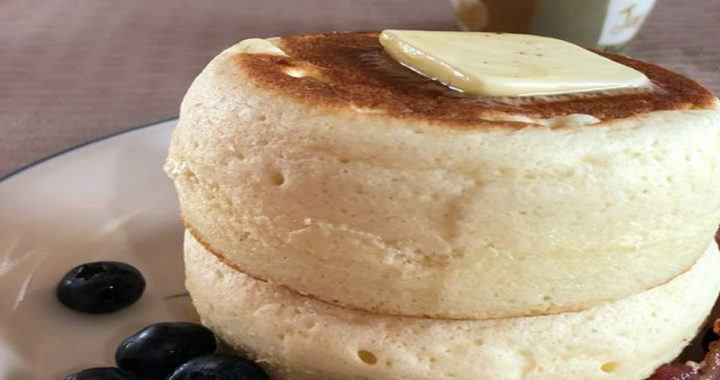 Your pancake batter should be very light, airy, but at the same time it needs to keep its shape. 10- Now, you need to pre-heat your pan, and I highly recommend you to use a nonstick pan. Don’t have one…? Here are our recommended pans, if you want to invest a few bucks on it. 11- Now, you use a ring to get a perfectly rounded Japanese pancake, or just put the ice cream scoop directly onto the pan. Then go ahead and cook these for about three minutes on each side. And make sure that the inside is fully cooked through. – Zest of 1/4 of a Lemon ( add lemon zest or 1 tsp vanilla). Tagged Japanese pancake, japanese pancake cabbage, japanese pancake okonomiyaki, japanese pancake recipe.